Sorry, but I couldn’t stop my happiness. It is a wonderful day for me. This day i.e. 8th October 2016 marks the first month of my blog, and I am glad that I have successfully crossed it and no less passionate than I was before starting my blog. I know this question is roaming around your mind and you want an answer to that. You see, when we start a new project, we stay consistent, hardworking and passionate at the beginning. But, as time passes, we start losing our consistency, and ultimately we quit the project. Personally speaking, this has happened to me almost every time, but it was not the case with my blog. Due to some college work, I wasn’t able to give time and complete my first-month blogging goals. I have achieved some pretty good results within the first 30 days of blogging. So, let me share some insight into my blog reports. All total, I have posted 18 articles on my blog (excluding this) for the first month. It comes to be an average of 4 articles per week. Insane. I wanted Google to index my site as much time as possible, but from now on I will limit this to 2-3 posts per week. Note that, almost all of my articles are more than 1000 words longer, and I haven’t compromised on the quality. I am very greedy when it comes to traffic. I love it when there are thousands of visitors reading your articles and appreciating your hard work. In the first month, my blog received more than 1600 page views, not a big number to brag, but still I consider it as an achievement. There was a traffic drop for few days, but overall the result is satisfactory. I have started spending more time on researching and writing SEO articles, which should provide better result next month. Also, after learning about the potential of Pinterest, I am spending at least 30 minutes every day using it. Hope to see some nice traffic from it. I am active on only two social channels as of now, Pinterest and Twitter. I am yet to start a Facebook page, and I am planning to create it in the next week itself. I have added subscriber widget and popup to collect emails and grow my list. But, till now only 17 users have subscribed to it. I am thinking of writing an Ebook to share with those who subscribe to my newsletter. Let’s see when I get time to do this. A quick question for you, what could be a good topic to write Ebook to give for free in exchange of subscriptions? Comment below. So, overall I have around 600 followers on my blog within my first month of blogging. I didn’t make any cents from my blog in the first month, and I hope this would not be the same for upcoming months. The funny thing is that it is not heartbreaking or demotivating because I didn’t even expect to make money for first 90 days (I will be on stars if I did). 1. Blogging is not easy, and you will have to treat it like a job to see the expected results. 2. Content is the king, but promotion is equally important. 3. You need to spend some money if you are serious about blogging. Free things do not always get the job done. 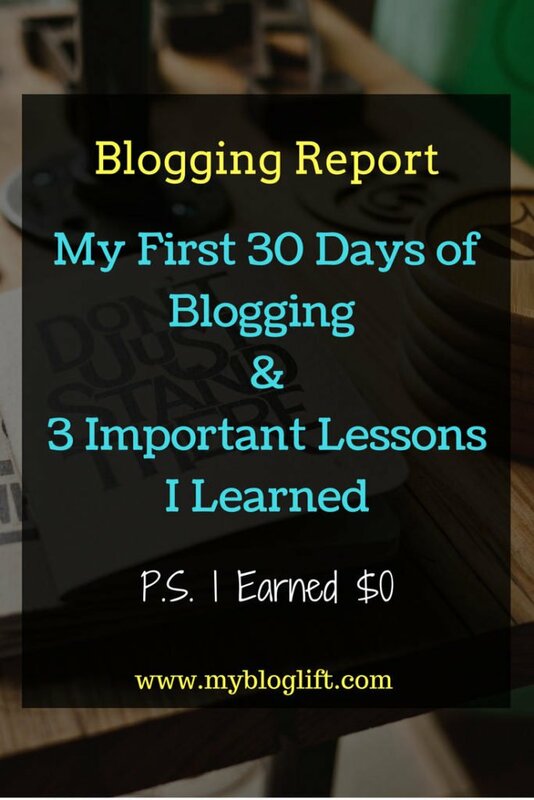 It was the insight of how my blog performed and what I learned from blogging for 30 days. All credits go to you, and I am thankful for the support I am receiving. Let’s keep it this way. Now it’s time to set new goals and keep me devoted to them. How was your first month of blogging? What were the results and how are you doing now? Share with me. Want to start a blog? Learn the secret sauce of creating a successful blog. P.S. – Check out my second-month blog income & traffic report. Great to see you being optimistic amd excited about your blog.I am wanted to ask how to add all the social media handles that you have at the bottom of your screen? I’m using Social Warfare plugin to add those floating social share button. I am really happy to find your blog. Your blog is really a inspiration for other new bloggers cause you are also starting from zero and a blogger feel more motivated by seeing newly rising blogs rather than already established blogs. So keep doing the good work. Thanks for the good words and good to see that my contents are motivating. Keep visiting. This is awesome. You mean you got that level of traffic in 30 days without a single advert? Wow! I’m challenged. But did you guest post? Though not consistent but I made over $100+ from consulting in my first 30 days and few adverts. But my page view was poor. Very poor. In 3 months I was getting 2000+ with an average of 4 post per month, lol, November I published only 2 posts. I can be that lazy for bloggers but everything has changed now. I’m now ready to work. I learnt it through the hard way that consistency is the key. I wish I can break down on freelance writing cos it’s taking my time. However, let me set another goal for my blog. Lest I forget, I had 1200 Twitter followers in my first 15 days of blogging. I am still grateful anyway. I had 600+ Facebook fans. No, I don’t guest post as I think of it as a waste of time in initial days of blogging. First, I will build my blog and then only think of doing guest posts. It’s great that you’re growing. Page views don’t matter as long as you see the growth in revenue and engagement from users. Meanwhile, you should check out my second month blog income & traffic report as well. Its a very awesome beginning for a newbie blogger, i am really impressed by the way you write articles and your blog does’t seems to be managed by a newbie blogger. Neat and Clean Theme with good loading time. I would like to say all the best to you for the upcoming blogging days. I have been a freelancer for about 8 months and created many side projects like Amazon affiliate sites, PBN, etc. And I love reading so I spent most of my time learning about SEO and other blogging materials. It is the first time I am working on my own personal blog and that’s why I said ‘First 30 days of blogging’. Lastly, I do not share anything I do not know about and haven’t tried. Anyway, thanks for taking time and showing your concern. Thanks for stopping by and connecting with me. I will publish my second-month blogging report on 8th November. Hope to see you then. So far the most concise and informative guidelines for blogging I have found. My question applies to my amateur launch into blogging. I do not have any one topic where I excel, I write what I feel which I know us doomed to fail. Would a topical calendar be advisable or will separate blogs be required per audience? There are multi-niche blogs which are performing well. It is not an issue as long as you can write good quality and helpful articles. On the other hand, single niche blogs are easier to rank and grow. But creating & managing more than one single niche blog is again a challenging work. Well! From day 5 I am visiting your site since I have started my blog on your day 5 due to some examinations I didn’t concentrate on my Blog. I hope you definitely cross your goals of one month within 15 days because your one-month success showing the result. I almost read all your blog posts I am very thankful for your writings that helped me a lot in the beginning because I entered into the new world of blogging. I think your Ebooks can be on How to become a successful blogger and another book to guide noobs about adsence earnings. Glad to hear that my experience and writing is helping someone. Thanks for kind words, though. About your suggestions, there are many Ebooks on the same topics & I don’t want to repeat what every other blogger is doing. However, let’s see if I can add some secret formulas.